X-rays are a form of electromagnetic radiation used to produce images called radiographs. The amount of radiation you are exposed to during an x-ray is minimal and will not harm you. During the procedure, x-ray beams pass through the body and are recorded. Areas where radiation has trouble passing will appear white as with bone. Soft tissues and organs will appear gray. Areas filled with air, such as your lungs, will appear dark. 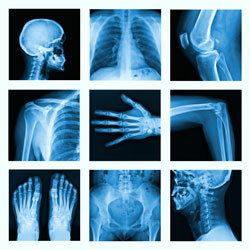 X-rays are commonly used to detect broken bones, find abnormal masses, and demonstrate bone and tissue relationships.